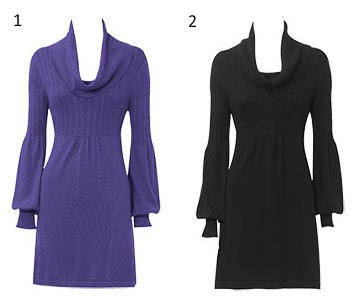 These two cowl neck dresses come from the latest collection at Oasis. The long sleeves provide maximum coverage and this dress can also be worn as something smart for work with trousers, or casually with jeans. It's available online now for £55. Click here for more info on these dresses from the Oasis online store. The dress is available for £65 from the Oasis online store, click here for more info. 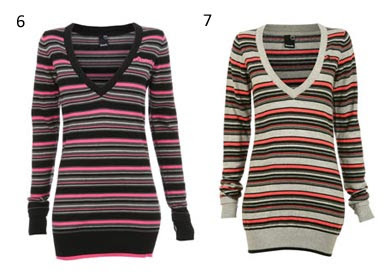 For a more casual look, check out these two striped jumper dresses from Republic. 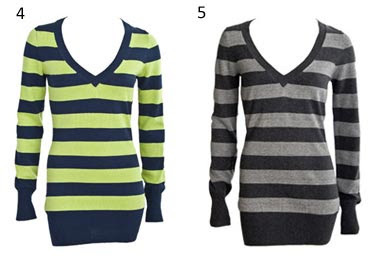 Again, they have long sleeves and a v-neck. I'd suggest wearing a vest top underneath if you're not happy with the low neck. These are a bargain at £19.99, click here for more info and to buy from the Republic online store. For something totally funky, Bench have these striped knit jumpers with bold colour combinations which really make a statement. These are available for £45. If these are a bit too much for you, Bench also have plain coloured jumper dresses for around £30. Click here to visit the Bench online store for more info.